Home Contests and Freebies Unisilver UnisilverTIME Watch and Time Free Watch from UnisilverTime daily and weekly! Free Watch from UnisilverTime daily and weekly! UnisilverTime always amuses me. I had the first watch from Unisilver which is a silver Makabayan Watch and I would guarantee that it is of highest quality. It had undergone several torture test and up to now the look and the quality remains the same as when I first have it. 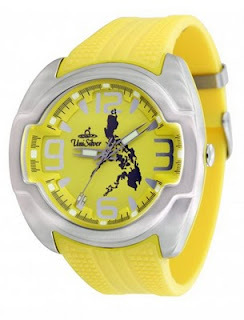 To celebrate the sheer Pinoy ingenuity perhaps, Unisilver Time is giving away weekly Makabayan Watch as prizes. I did win one watch during Week 1 and it is a cool yellow watch with the Philippine map engraved on the inside. All I did was comment on the watch photo and walla I did won. Pretty easy if you ask me. Unisilver Time is also giving away daily free watches and like the weekly prizes all you have to do is follow the instructions and then you will have the chance to take home the watch of the day. So what do you need to win? COMMENT on the weekly Makabayan Watch Post to get a chance and take it home for FREE!!! !